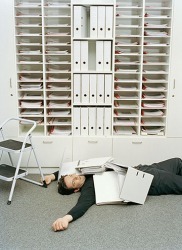 He was pummeled by the files when he fell off of the step stool. Pummeled is defined as having been hit hard over and over again. An example of pummeled is what happened to the quarterback that kept getting hit during the game. "pummeled." YourDictionary, n.d. Web. 15 April 2019. <https://www.yourdictionary.com/PUMMELED>. His opponent was smaller but faster, and he got pummeled. Waves of wind-driven rain pummeled the terminal with a fury.